The pages had been "under their noses" unrecognised in the library's archives. Erika Delbecque, special collections librarian at the university, described the find as "incredibly rare". The two pages, with religious texts in medieval Latin, were produced by Caxton at his pioneering printing works in Westminster - and are now going on public display for the first time since they were sold from his print shop in the 15th Century. They are believed to be from the earliest years of Caxton's printing press, either 1476 or 1477, and are being hailed as a remarkable discovery. An early printing specialist, Andrew Hunter, of Blackwells Books, said that in the world of rare books, a find like this has a "special, almost magic, resonance". "The leaf had previously been pasted into another book for the undignified purpose of reinforcing its spine," says librarian Ms Delbeque, who first recognised the pages' significance. "We understand it was rescued by a librarian at the University of Cambridge in 1820, who had no idea that it was an original Caxton leaf." 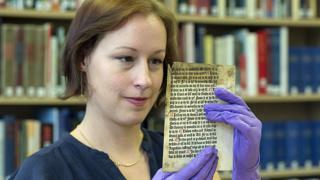 BBC History: Who was William Caxton? But they had not been recognised as Caxton's work until Ms Delbeque was cataloguing a collection of loose pages which had been detached from their original books. "I suspected it was special as soon as I saw it. The trademark black letter typeface, layout and red paragraph marks indicate it is very early Western European printing," she said. "It is astonishing that it has been under our noses for so long." "Its condition is good, considering that it spent some 300 years bound in the spine of a book and another 200 resting forgotten in an album of fragments rescued from other bindings," said Dr Hellinga. But the arrival of printing meant that the book could be reproduced much more readily and cheaply - and it is believed that there might have been hundreds of copies produced by Caxton's press. This copy also shows how books were in a transition from manuscripts to printing - as the red marks on the page, showing paragraph breaks, were added by hand after printing. The pages will go on public display from 10 to 30 May at the Museum of English Rural Life at the University of Reading.